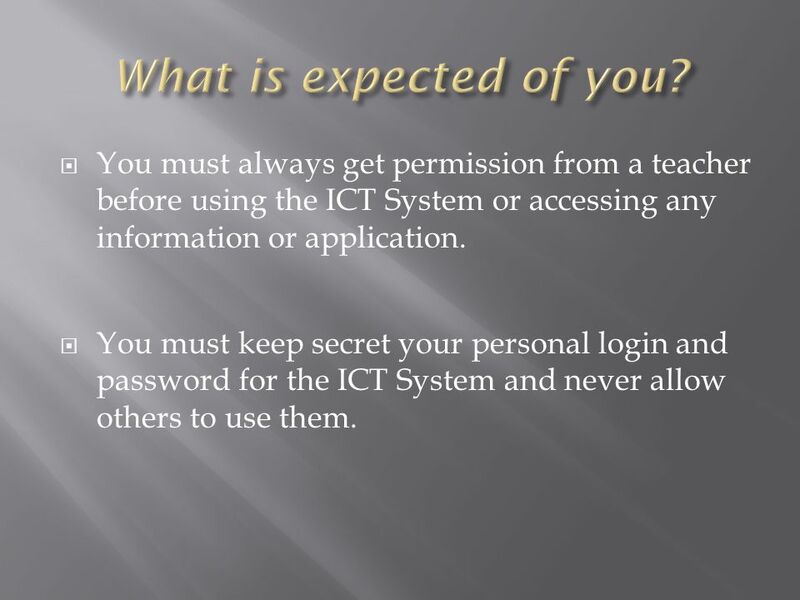  You must always get permission from a teacher before using the ICT System or accessing any information or application.  You must keep secret your personal. 2  You must always get permission from a teacher before using the ICT System or accessing any information or application.  You must keep secret your personal login and password for the ICT System and never allow others to use them. 3  You must not attempt to access any part of the ICT System that is not part of your personal desktop. 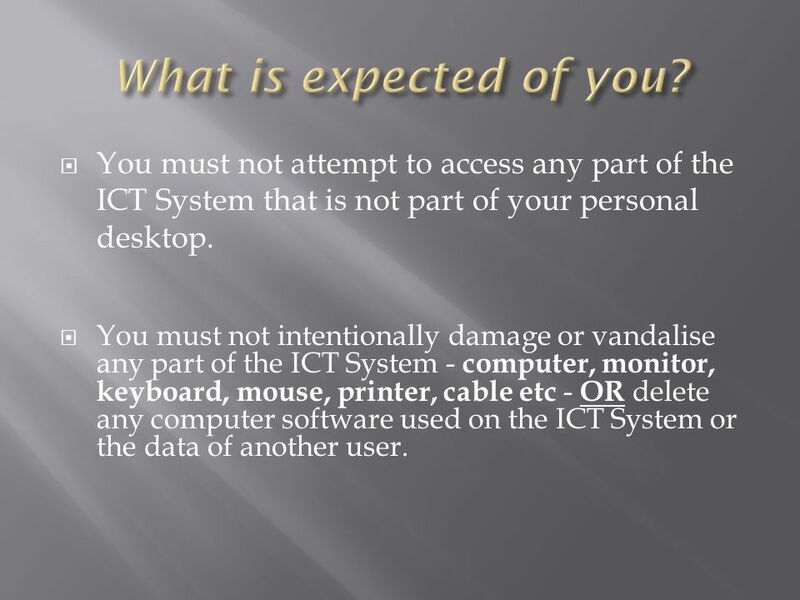  You must not intentionally damage or vandalise any part of the ICT System - computer, monitor, keyboard, mouse, printer, cable etc - OR delete any computer software used on the ICT System or the data of another user. 4  You must not intentionally introduce software designed to cause damage to a school computer (commonly known as a virus). 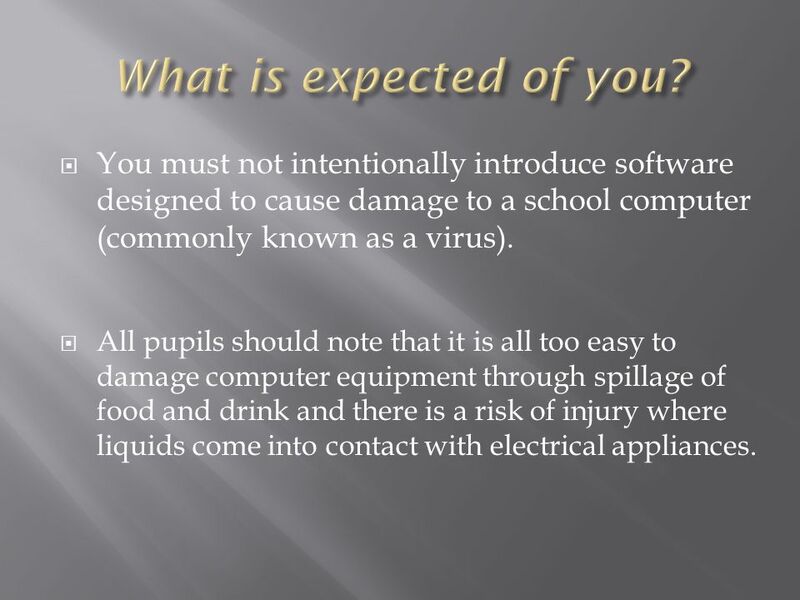  All pupils should note that it is all too easy to damage computer equipment through spillage of food and drink and there is a risk of injury where liquids come into contact with electrical appliances. 5  You must always end your session on a computer by closing it down correctly. If you are not sure - ask your teacher.  Sending or displaying any abusive, sexist, racist or otherwise offensive material is strictly forbidden. 6  Accessing or attempting to access any inappropriate or offensive material. 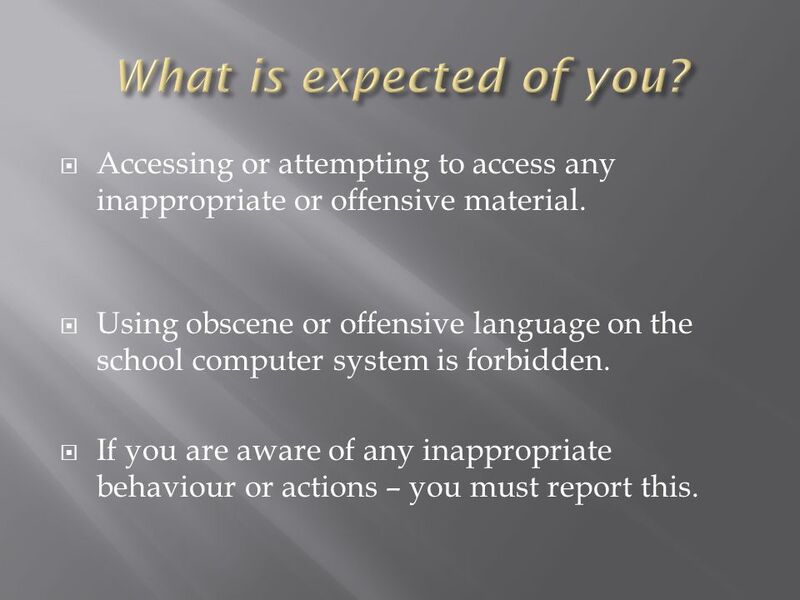  Using obscene or offensive language on the school computer system is forbidden.  If you are aware of any inappropriate behaviour or actions – you must report this. 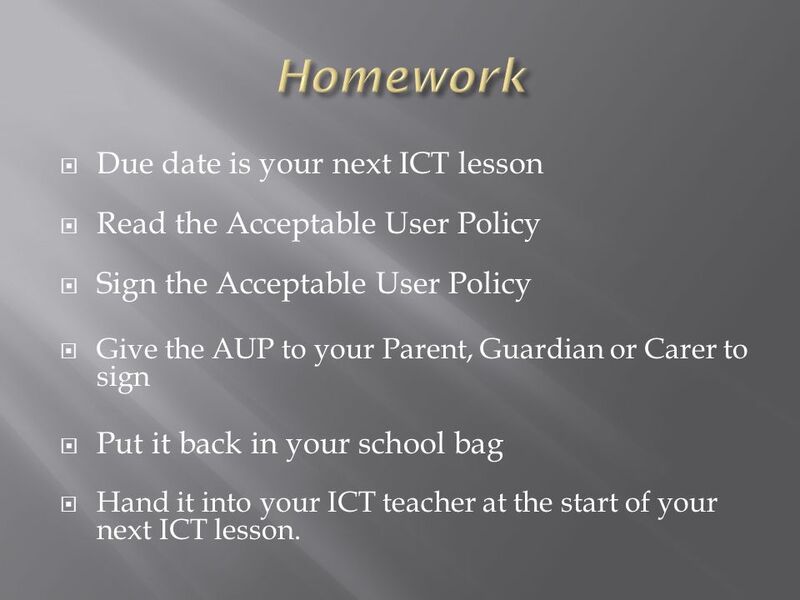 7  Due date is your next ICT lesson  Read the Acceptable User Policy  Sign the Acceptable User Policy  Give the AUP to your Parent, Guardian or Carer to sign  Put it back in your school bag  Hand it into your ICT teacher at the start of your next ICT lesson. Download ppt " You must always get permission from a teacher before using the ICT System or accessing any information or application.  You must keep secret your personal." MADISON COUNTY SCHOOLS ACCEPTABLE USE AND INTERNET SAFETY POLICY. Computer Care. The Power Cord Dont drop your laptop. Rules for the ICT Classroom Always follow the teacher’s instructions. Never let anyone else know your password – you may lose your ability to use the network. E-Safety Challenge College. Learning Objectives To examine our school’s Acceptable User Policy (AUP) for the Internet and school network. Cambridge Center for Adult Education. Food or DrinkUnethical Behavior Back It Up! Temperature Control Campground Rule. Guidance Dealing with pupils/parents who cyberbully staff. By: Mrs. Allen.  To protect yourself and equipment, never tamper with or remove any power cords or cables (including mouse and keyboard)  To safeguard. Computer Lab Management 101 Adamsville High School. 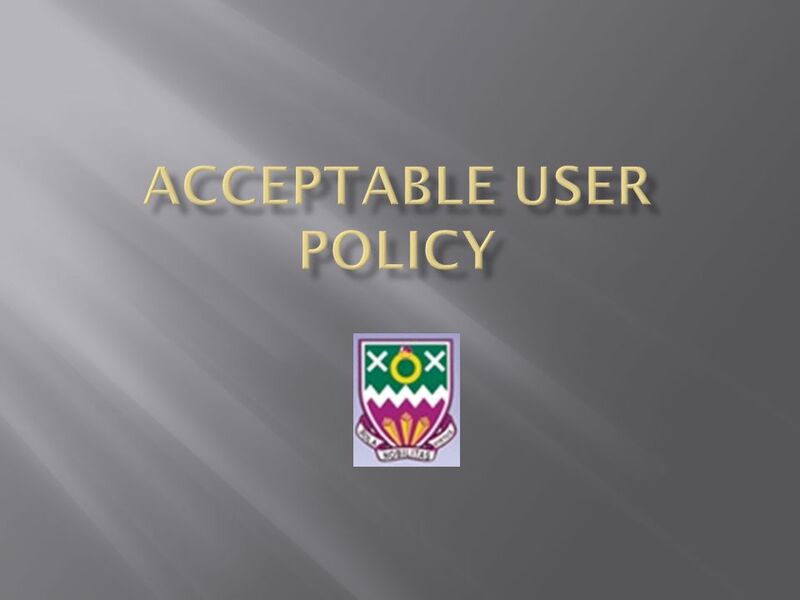 Acceptable Use Policy (or Fair Use): For Users of Computers and other technology. Uintah School District Acceptable Use for Computer and Network Access. COMPUTER BASICS and ACCEPTABLE USE. KEYBOARDING BODY BASICS  SITTING –Sit up straight with your feet on the floor.  HANDS –Keep you fingers on the home. East Ayrshire Libraries Acceptable Use Policy and Filtering. Responsible Use Policy Technical Applications Mr. Hibbs, Mrs. Brau, & Coach Merkle Granbury Middle School. As it would be in any other subject.  Always follow the teacher’s instructions.  Never let anyone else know your password – you may lose your ability. Student 1-to-1 Netbook Program Care and Use of Computers.